Fresh Market plans to open its new store in Norfolk’s Ghent neighborhood near the end of 2014. The specialty grocer has signed a lease on space in Ghent Station, a development planned for West 21st Street between Hampton Boulevard and Colley Avenue. 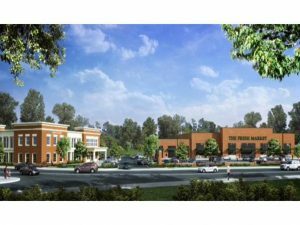 The mixed-use plaza, anchored by the grocer, will include 4,200 square feet of additional retail space and a two-story Bon Secours medical office building. The four retail spaces adjacent to Fresh Market are still available. 21st Street Partners LLC – a joint venture for Stanton Partners, a commercial real estate company, and Robinson Development Group – plans to spend about $15 million on the project. The goal is to start demolishing the two vacant buildings on the property in December, said Chris Sanders, senior vice president of Robinson Development Group. “We’d like to be shovel-ready by Jan. 1,” he said. The city estimated demolition costs at $460,000, and agreed to pay up to $250,000. They have not closed on the property, but the developers will pay the city $500,000 for the 3.75-acre site. Council approved the price in December, despite criticism from residents and neighboring business owners who said the property was worth more. City records show the last assessment at $2.3 million and a 2006 appraisal of about $5.4 million. The city’s design review committee will consider the project plans on Monday, Oct. 7. If approved, they will move to the planning commission. City council must then approve a rezoning application to allow for retail and office space. The property is zoned for commercial use only. 21st Street Partners has hired Randolph Hicks AIA and Odell, a Richmond-based firm, to be the project’s design architects. Stroud Pence, a Virginia Beach-based company, has been hired as the structural engineer. The 22,800-square-foot store in Ghent will be the chain’s fourth location in Hampton Roads and 11th in Virginia. Fresh Market has stores in Virginia Beach, Newport News and Williamsburg, and plans stores in Ashburn and Alexandria. Each location employs about 90 people, said Catherine Koonce, a Fresh Market spokeswoman, in an email response to questions. Though the Ghent store will be less than a mile from Farm Fresh and Harris Teeter, she said, it offers a different shopping experience. The Ghent Neighborhood League will host a public meeting with city officials on Wednesday at 6:30 p.m. at The Williams School. League president Henry Conde said Ghent residents and businesses have yet to be briefed on the project. Though excited about the prospect of development along that stretch of West 21st Street, the neighborhood league is concerned about traffic flow, parking and deliveries. He expects the store to draw shoppers from all over the region since he often travels to the store in Virginia Beach for specialty items.